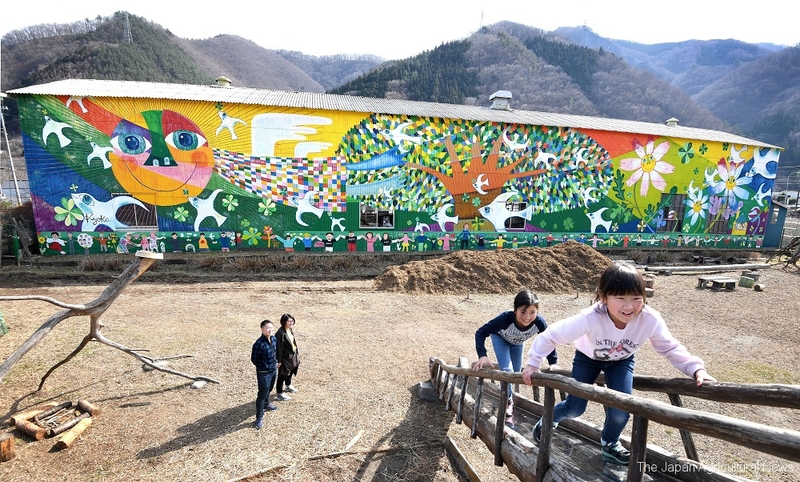 “The mural of hope” in the park created at a quake-hit farmland. Colorful plants and animals in vivid and bright colors watch over the children playing in the park. The idea of painting the wall came from a word murmured by a girl. In 2012, Fujii created the park in 2012, and one day, she saw a girl playing in the park holding a notebook. In the notebook, Fujii saw a drawing of the girl trying to escape from the tsunami. The girl was full of fears when she quietly told Fujii that the wall looked like a tsunami when it was wet in the rain. So, in 2013, Fujii launched “the project for creating the wall of hope.” A Thailand-based professional painter, Kyoko Abe, assisted her in drawing a rough sketch. Then gradually, people started to gather to support the project. There were children who lost their parents and a man who lost his mother and was suffering from depression. They came to the park to join the project. “Doing something to help others will help me to recover from the loss,” the man said and painted the wall, sobbing. The children held hands with each other and stood with their backs against the wall to make life-size paintings of themselves. “Looking at the children laughing with paint on their faces, hands, and clothes was an uplifting experience. I was so happy,” said Fujii. It took a year to complete the project supported by more than 600 volunteers. The park currently has approximately 40,000 visitors a year. “It’ll take a lot longer for us to be healed, but seeing children smiling will make us all happy,” Fujii said. The mural will continue to watch over the children playing and growing in the park.